Hiroshima (広島市 Hiroshima-shi, /hɪˈrɒʃɪmə, ˌhɪroʊˈʃiːmə/; Japanese: [çiɾoɕima]) is the capital of Hiroshima Prefecture and the largest city in the Chūgoku region of western Honshu, the largest island of Japan. Hiroshima gained city status on April 1, 1889. On April 1, 1980, Hiroshima became a designated city. As of August 2016, the city had an estimated population of 1,196,274. The gross domestic product (GDP) in Greater Hiroshima, Hiroshima Urban Employment Area, was US$61.3 billion as of 2010. Kazumi Matsui has been the city's mayor since April 2011. Hiroshima was the first city targeted by a nuclear weapon, when the United States Army Air Forces (USAAF) dropped an atomic bomb on the city at 8:15 a.m. on August 6, 1945, near the end of World War II. Hiroshima was established on the delta coastline of the Seto Inland Sea in 1589 by powerful warlord Mōri Terumoto. Hiroshima Castle was quickly built, and in 1593 Mōri moved in. Terumoto was on the losing side at the Battle of Sekigahara. The winner of the battle, Tokugawa Ieyasu, deprived Mōri Terumoto of most of his fiefs, including Hiroshima and gave Aki Province to Masanori Fukushima, a daimyō who had supported Tokugawa. From 1619 until 1871, Hiroshima was ruled by the Asano clan. During World War II, the Second General Army and Chūgoku Regional Army were headquartered in Hiroshima, and the Army Marine Headquarters was located at Ujina port. The city also had large depots of military supplies, and was a key center for shipping. On Monday, August 6, 1945, at 8:15 a.m., the nuclear weapon "Little Boy" was dropped on Hiroshima from an American Boeing B-29 Superfortress, the Enola Gay, flown by Colonel Paul Tibbets, directly killing an estimated 70,000 people, including 20,000 Japanese combatants and 2,000 Korean slave laborers. By the end of the year, injury and radiation brought the total number of deaths to 90,000–166,000. The population before the bombing was around 340,000 to 350,000. About 70% of the city's buildings were destroyed, and another 7% severely damaged. The public release of film footage of the city following the attack, and some of the Atomic Bomb Casualty Commission research about the human effects of the attack, were restricted during the occupation of Japan, and much of this information was censored until the signing of the Treaty of San Francisco in 1951, restoring control to the Japanese. As Ian Buruma observed, "News of the terrible consequences of the atom bomb attacks on Japan was deliberately withheld from the Japanese public by US military censors during the Allied occupation—even as they sought to teach the natives the virtues of a free press. Casualty statistics were suppressed. Film shot by Japanese cameramen in Hiroshima and Nagasaki after the bombings was confiscated. "Hiroshima", the account written by John Hersey for The New Yorker, had a huge impact in the US, but was banned in Japan. As [John] Dower says: 'In the localities themselves, suffering was compounded not merely by the unprecedented nature of the catastrophe ... but also by the fact that public struggle with this traumatic experience was not permitted." The US occupation authorities maintained a monopoly on scientific and medical information about the effects of the atomic bomb through the work of the Atomic Bomb Casualty Commission, which treated the data gathered in studies of hibakusha as privileged information rather than making the results available for the treatment of victims or providing financial or medical support to aid victims. The book Hiroshima by John Hersey was originally featured in article form and published in the magazine The New Yorker, on 31 August 1946. It is reported to have reached Tokyo, in English, at least by January 1947 and the translated version was released in Japan in 1949. Despite the fact that the article was planned to be published over four issues, "Hiroshima" made up the entire contents of one issue of the magazine. Hiroshima narrates the stories of six bomb survivors immediately prior to and four months after the dropping of the Little Boy bomb. Oleander (Nerium) is the official flower of the city of Hiroshima because it was the first to bloom again after the explosion of the atomic bomb in 1945. Hiroshima has a humid subtropical climate characterized by cool to mild winters and hot humid summers. Like much of the rest of Japan, Hiroshima experiences a seasonal temperature lag in summer; with August rather than July being the warmest month of the year. Precipitation occurs year-round, although winter is the driest season. Rainfall peaks in June and July, with August experiencing sunnier and drier conditions. Other popular places in the city include the Namiki-dōri shopping area. In 2017, the city has an estimated population of 1,195,327. The total area of the city is 905.08 square kilometres (349.45 sq mi), with a population density of 1321 persons per km². Hiroshima is known for okonomiyaki, a savory (umami) pancake cooked on an iron plate, usually in front of the customer. It is cooked with various ingredients, which are layered rather than mixed together as done with the Osaka version of okonomiyaki. The layers are typically egg, cabbage, bean sprouts (moyashi), sliced pork/bacon with optional items (mayonnaise, fried squid, octopus, cheese, mochi, kimchi, etc. ), and noodles (soba, udon) topped with another layer of egg and a generous dollop of okonomiyaki sauce (Carp and Otafuku are two popular brands). The amount of cabbage used is usually 3 to 4 times the amount used in the Osaka style. It starts out piled very high and is generally pushed down as the cabbage cooks. The order of the layers may vary slightly depending on the chef's style and preference, and ingredients will vary depending on the preference of the customer. Hiroshima has several professional sports clubs. The city's main football club are Sanfrecce Hiroshima, who play at the Hiroshima Big Arch. As Toyo Kogyo Soccer Club, they won the Japan Soccer League five times between 1965 and 1970 and the Emperor's Cup in 1965, 1967 and 1969. After adopting their current name in 1992, the club won the J.League in 2012 and 2013. The city's main women's football club is Angeviolet Hiroshima. Defunct clubs include Rijo Shukyu FC, who won the Emperor's Cup in 1924 and 1925, and Ẽfini Hiroshima SC. Hiroshima Toyo Carp are the city's major baseball club, and play at the Mazda Zoom-Zoom Stadium Hiroshima. Members of the Central League, the club won the Japan Series in 1979, 1980 and 1984. Other sports clubs include Hiroshima Dragonflies (basketball), Hiroshima Maple Reds (handball) and JT Thunders (volleyball). The Chūgoku Shimbun is the local newspaper serving Hiroshima. It publishes both morning paper and evening editions. Television stations include Hiroshima Home Television, Hiroshima Telecasting, Shinhiroshima Telecasting, and the RCC Broadcasting. Radio stations include Hiroshima FM, Chugoku Communication Network, FM Fukuyama, FM Nanami, and Onomichi FM. Hiroshima is also served by NHK, Japan's public broadcaster, with television and radio broadcasting. Streetcars and light rail vehicles are still rolling down Hiroshima's streets, including streetcars 651 and 652, which survived the atomic blast and are among the older streetcars in the system. When Kyoto and Fukuoka discontinued their trolley systems, Hiroshima bought them up at discounted prices, and, by 2011, the city had 298 streetcars, more than any other city in Japan. Hiroshima is served by Japan National Route 2, Japan National Route 54, Japan National Route 183, Japan National Route 261 Japan National Route 433, Japan National Route 487, Japan National Route 488, Hiroshima Prefectural Route 37 (Hiroshima-Miyoshi Route), Hiroshima Prefectural Route 70 (Hiroshima-Nakashima Route), Hiroshima Prefectural Route 84 (Higashi Kaita Hiroshima Route), Hiroshima Prefectural Route 164 (Hiroshima-Kaita Route), and Hiroshima Prefectural Route 264 (Nakayama-Onaga Route). The Japanese city and Perfecture of Hiroshima may have been devastated by the atomic bomb over 73 years ago, but today, this site of the destruction is one of the top tourist destinations in the entire country. Statistics released by the nation's tourist agency revealed that around 363,000 visitors went to the metropolis during 2012, with US citizens making up the vast majority of that figure, followed by Australians and Chinese. ^ "The Origin of Hiroshima". Hiroshima Peace Culture Foundation. Archived from the original on 2008-01-30. Retrieved 2007-08-17. ^ Scott O'Bryan (2009). "Hiroshima: History, City, Event". About Japan: A Teacher's Resource. Retrieved 2010-03-14. ^ Kosaikai, Yoshiteru (2007). "History of Hiroshima". Hiroshima Peace Reader. Hiroshima Peace Culture Foundation. ^ Jacobs, Norman (1958). The Origin of Modern Capitalism and Eastern Asia. Hong Kong University. p. 51. ^ Sanko (1998). Hiroshima Peace Memorial (Genbaku Dome). The City of Hiroshima and the Hiroshima Peace Culture Foundation. ^ "Diocese of Hiroshima". Catholic-Hierarchy.org. David M. Cheney. Retrieved 21 January 2015. ^ United States Strategic Bombing Survey (June 1946). "U. S. Strategic Bombing Survey: The Effects of the Atomic Bombings of Hiroshima and Nagasaki". nuclearfiles.org. Archived from the original on 2004-10-11. Retrieved 2009-07-26. ^ Pape, Robert (1996). Bombing to Win: Airpower and Coercion in War. Cornell University Press. p. 129. ISBN 978-0-8014-8311-0. ^ "Japan in the Modern Age and Hiroshima as a Military City". The Chugoku Shimbun. Retrieved 2007-08-19. ^ The Atomic Bombing of Hiroshima Archived 2016-03-03 at the Wayback Machine, U.S. Department of Energy, Office of History and Heritage Resources. ^ "Frequently Asked Questions – Radiation Effects Research Foundation". Rerf.or.jp. Archived from the original on 2007-09-19. Retrieved 2011-07-29. ^ Seldon, Mark (December 2016). "American Fire Bombing and Atomic Bombing of Japan in History and Memory". The Asia-Pacific Journal. 14 – via Japan Focus. ^ a b Roger Angell, From the Archives, "Hersey and History", The New Yorker, July 31, 1995, p. 66. ^ http://www.japantimes.co.jp/culture/2009/08/16/books/the-pure-horror-of-hiroshima/#.UdhVsfnVDTc The pure horror of Hiroshima, published in The Japan Times by Donald Richie. ^ Sharp, "From Yellow Peril to Japanese Wasteland: John Hersey's 'Hiroshima'", Twentieth Century Literature 46 (2000): 434–452, accessed March 15, 2012. ^ Jon Michaub, "Eighty-Five From the Archive: John Hersey" The New Yorker, June 8, 2010, np. ^ John Hersey, Hiroshima (New York: Random House, 1989). ^ 広島市　市の木・市の花. Retrieved 2012-07-15. ^ Excite エキサイト. Archived from the original on 2012-07-10. ^ "Peace Memorial City, Hiroshima". Hiroshima Peace Culture Foundation. Archived from the original on 2008-02-06. Retrieved 2007-08-14. ^ "Fifty Years for the Peace Memorial Museum". Hiroshima Peace Memorial Museum. Retrieved 2007-08-17. ^ "Hiroshima Peace Memorial Park". Japan Deluxe Tours. Retrieved 2017-05-23. ^ "Surviving the Atomic Attack on Hiroshima, 1944". Eyewitnesstohistory.com. 1945-08-06. Retrieved 2009-07-17. ^ "Library: Media Gallery: Video Files: Rare film documents devastation at Hiroshima". Nuclear Files. Retrieved 2009-07-17. ^ "President Obama Visits Hiroshima". The New York Times. Archived from the original on 2008-02-06. Retrieved 2016-05-31. ^ 気象庁 / 平年値（年・月ごとの値）. Japan Meteorological Agency. ^ "Hiroshima – Most famous Sights | Planetyze". Planetyze. Retrieved 2017-07-27. ^ 広島市勢要覧 (PDF). Government of Hiroshima City. ^ Terry, Thomas Philip (1914). Terry's Japanese Empire. Houghton Mifflin Co. p. 640. ^ a b "2006 Statistical Profile". The City of Hiroshima. Archived from the original on 2008-02-06. Retrieved 2007-08-14. ^ "Wel City Hiroshima". Wel-hknk.com. Retrieved 2011-06-13. ^ 広島市交通科学館 [Hiroshima City Transportation Museum]. ^ a b "Peace Newspaper produced by Japanese teenagers: Peace Seeds:feature story". ^ "Hiroshima increasingly popular with tourists | Inside Japan Tours". insidejapantours.com. Retrieved 2017-07-27. ^ "History of Hiroshima University". Hiroshima University. Archived from the original on 2007-06-29. Retrieved 2007-06-25. ^ "Introduction to our Sister and Friendship Cities". City.hiroshima.jp. Archived from the original on 2011-05-03. Retrieved 2010-05-10. ^ "Friendly relationship at Official website of Volgograd". Volgadmin.ru. 1994-12-01. Archived from the original on 2008-12-20. Retrieved 2011-06-13. Kowner, Rotem (2002). "Hiroshima". In M. Ember; C. Ember (eds.). Encyclopedia of Urban Cultures (Vol. II). Grolier. pp. 341–348. ISBN 978-0717256983. The 1994 Asian Games (Japanese: 1994年アジア競技大会, 1994-nen Ajia kyōgi taikai), also known as the XII Asiad and the 12th Asian Games, were held from October 2 to 16, 1994, in Hiroshima, Japan. The main theme of this edition was to promote peace and harmony among Asian nations. It was emphasized by the host because the venue was the site of the first atomic bomb attack 49 years earlier. Due to the 1991 Gulf War, Iraq was suspended from the games.There were a total number of 6,828 athletes and officials involved, from 42 countries, with a total number of 34 events. Debut sports at this edition of the Asiad were baseball, karate and modern pentathlon. Hiroshima New Transit Line 1 (広島新交通1号線, Hiroshima Shin Kōtsū 1-gō-sen), also known as the Astram Line (アストラムライン, Asutoramurain), is a rubber-tired transit system operated by Hiroshima Rapid Transit in Hiroshima, Japan. Astram opened August 20, 1994 for the 1994 Asian Games in Hiroshima. The line connects between central Hiroshima and Hiroshima Big Arch, which was the main stadium of the Asian Games. On March 14, 2015, a new station, Shin-Hakushima, opened to make a new connection between the Astram Line and JR lines. Over the course of time, different arguments have gained and lost support as new evidence has become available and as new studies have been completed. A primary and continuing focus has been on the role of the bombings in Japan's surrender and the U.S.'s justification for them based upon the premise that the bombings precipitated the surrender. This remains the subject of both scholarly and popular debate. In 2005, in an overview of historiography about the matter, J. Samuel Walker wrote, "the controversy over the use of the bomb seems certain to continue". Walker stated, "The fundamental issue that has divided scholars over a period of nearly four decades is whether the use of the bomb was necessary to achieve victory in the war in the Pacific on terms satisfactory to the United States. "Supporters of the bombings generally assert that they caused the Japanese surrender, preventing massive casualties on both sides in the planned invasion of Japan: Kyūshū was to be invaded in November 1945 and Honshū four months later. It was thought Japan would not surrender unless there was an overwhelming demonstration of destructive capability. Those who oppose the bombings argue it was militarily unnecessary, inherently immoral, a war crime, or a form of state terrorism. Critics believe a naval blockade and conventional bombings would have forced Japan to surrender unconditionally. Some critics believe Japan was more motivated to surrender by the Soviet Union's invasion of Manchuria and other Japanese-held areas. The Hiroshima Big Arch (広島ビッグアーチ, Hiroshima Biggu Āchi), known under current sponsorship as Edion Stadium Hiroshima (エディオンスタジアム広島, Edion Sutajiamu Hiroshima), is a multi-purpose stadium in Hiroshima, Japan. It used mostly for association football matches and also for athletics. The venue is the home of J. League club Sanfrecce Hiroshima. It has a capacity of 36,894. It is an all-seater. It was formerly known as Hiroshima Park Stadium. The Enola Gay () is a Boeing B-29 Superfortress bomber, named after Enola Gay Tibbets, the mother of the pilot, Colonel Paul Tibbets. On 6 August 1945, during the final stages of World War II, it became the first aircraft to drop an atomic bomb. The bomb, code-named "Little Boy", was targeted at the city of Hiroshima, Japan, and caused the near-complete destruction of the city. Enola Gay participated in the second atomic attack as the weather reconnaissance aircraft for the primary target of Kokura. Clouds and drifting smoke resulted in a secondary target, Nagasaki, being bombed instead. After the war, the Enola Gay returned to the United States, where it was operated from Roswell Army Air Field, New Mexico. In May 1946, it was flown to Kwajalein for the Operation Crossroads nuclear tests in the Pacific, but was not chosen to make the test drop at Bikini Atoll. Later that year it was transferred to the Smithsonian Institution, and spent many years parked at air bases exposed to the weather and souvenir hunters, before being disassembled and transported to the Smithsonian's storage facility at Suitland, Maryland, in 1961. In the 1980s, veterans groups engaged in a call for the Smithsonian to put the aircraft on display, leading to an acrimonious debate about exhibiting the aircraft without a proper historical context. The cockpit and nose section of the aircraft were exhibited at the National Air and Space Museum (NASM) in downtown Washington, D.C., for the bombing's 50th anniversary in 1995, amid controversy. Since 2003, the entire restored B-29 has been on display at NASM's Steven F. Udvar-Hazy Center. The last survivor of its crew, Theodore Van Kirk, died on 28 July 2014 at the age of 93. Fukuyama (福山市, Fukuyama-shi) is a city located on the Ashida River in Hiroshima Prefecture, Japan. As of January 31, 2010, the city has an estimated population of 465,238 and a population density of 898.02 persons per km². The total area is 461.23 km2 (178.08 sq mi). After Hiroshima, it is the largest city in Hiroshima Prefecture and is located on the far east side of the prefecture. The city's symbol is the rose and it holds an annual Rose Festival in the month of May. Fukuyama is a vital commercial, industrial and communications center. It produces machinery, koto (Japanese harps), rubber products, electronics, textiles, and processed foods. The Hiroshima Dragonflies (広島ドラゴンフライズ) are a professional basketball team based in Hiroshima, Japan. In October 2014 they commenced competing in the Western Conference of the Japanese National Basketball League. In September 2016 they joined the B.League, the NBL's successor league, and play in the lower division's Western Conference. The Hiroshima Peace Memorial (広島平和記念碑, Hiroshima Heiwa Kinenhi), originally the Hiroshima Prefectural Industrial Promotion Hall, and now commonly called the Genbaku Dome, Atomic Bomb Dome or A-Bomb Dome (原爆ドーム, Genbaku Dōmu), is part of the Hiroshima Peace Memorial Park in Hiroshima, Japan and was designated a UNESCO World Heritage Site in 1996. The ruin of the hall serves as a memorial to the people who were killed in the atomic bombing of Hiroshima on 6 August 1945. Over 70,000 people were killed instantly, and another 70,000 suffered fatal injuries from the radiation. 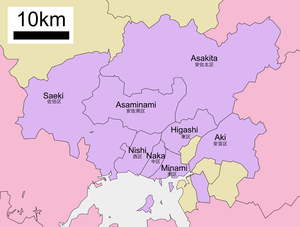 Kitahiroshima (北広島市, Kitahiroshima-shi) is a city located in Ishikari, Hokkaido, Japan. "Kita" is the Japanese word for "north", so the town's name, Kitahiroshima-shi, is translated as "North-Hiroshima city" or "city of North-Hiroshima". As of April 30, 2017, the city has an estimated population of 58,918, with 27,221 households, and the density of 500 persons per km². The total area is 118.54 square kilometres (45.77 sq mi). Kure (呉市, Kure-shi) is a port and major shipbuilding city situated on the Seto Inland Sea in Hiroshima Prefecture, Japan. With a strong industrial heritage Kure hosts the second oldest naval dockyard in Japan and remains an important base for the Japan Maritime Self-Defence Force (JMSDF). As of 1 May 2015, the city has an estimated population of 228,030 and a population density of 646 persons per km². The total area is 352.80 km². Little Boy was developed by Lieutenant Commander Francis Birch's group at the Manhattan Project's Los Alamos Laboratory during World War II, a development of the unsuccessful Thin Man nuclear bomb. Like Thin Man, it was a gun-type fission weapon, but it derived its explosive power from the nuclear fission of uranium-235, whereas Thin Man was based on fission of plutonium-239. Fission was accomplished by shooting a hollow cylinder of enriched uranium (the "bullet") onto a solid cylinder of the same material (the "target") by means of a charge of nitrocellulose propellant powder. It contained 64 kg (141 lb) of enriched uranium, although less than a kilogram underwent nuclear fission. Its components were fabricated at three different plants so that no one would have a copy of the complete design. After the war ended, it was not expected that the inefficient Little Boy design would ever again be required, and many plans and diagrams were destroyed. However, by mid-1946, the Hanford Site reactors began suffering badly from the Wigner effect, the dislocation of atoms in a solid caused by neutron radiation, and plutonium became scarce, so six Little Boy assemblies were produced at Sandia Base. The Navy Bureau of Ordnance built another 25 Little Boy assemblies in 1947 for use by the Lockheed P2V Neptune nuclear strike aircraft which could be launched from the Midway-class aircraft carriers. All the Little Boy units were withdrawn from service by the end of January 1951. Sanfrecce Hiroshima (Japanese: サンフレッチェ広島, translit. Sanfuretche Hiroshima) is a professional football club based in Asaminami-ku, Hiroshima, Japan. The club play in the J1 League, which is the top tier of football in the country. The Beatles Anthology is a television documentary, a three-volume set of double albums, and a book focusing on the history of the Beatles. Paul McCartney, George Harrison and Ringo Starr all participated in the making and approval of the works, which are sometimes referred to collectively as the Anthology project, while John Lennon had archival interviews. The documentary series was first broadcast in November 1995, with expanded versions released on VHS and Laserdisc in 1996 and on DVD in 2003. The documentary used interviews with the Beatles and their associates to narrate the history of the band as seen through archival footage and performances. The Anthology book, released in 2000, paralleled the documentary in presenting the group's history through quotes from interviews. The initial volume of the album set (Anthology 1) was released the same week of the documentary's airdate, with the subsequent two volumes (Anthology 2 and Anthology 3) released in 1996. They included unreleased performances and outtakes presented in roughly chronological order, along with two new songs based on demo tapes recorded by Lennon after the group broke up: "Free as a Bird" and "Real Love", both produced by Jeff Lynne.